As beginning tai chi students, one of the first instructions we hear is to place our weight into “the bubbling well.” This instruction is a foundation of not only our first attempts to embody the principles of tai chi footwork but it is also the foundation of tai chi’s essential principle: working with energy. Throughout our tai chi practice, we cannot over emphasize the importance of the “bubbling well” and we should never stop thinking about its relevance as we develop our skills through practice. This is an exciting time in the history of anatomy and biomechanics. Imaging of living bodies is possible through many technological advances like MRI and endoscopic photography. The information derived from our ability to study living structure is overturning many of our beliefs about how a living creature’s structure is developed and maintained over the course of a lifetime. The mechanism that creates our structure from the moment an ovum encounters a spermatozoon is the same as the one that began our vertebrate history on land about 375 million years ago when an enterprising group of fishes decided to use their fins to walk rather than swim. Even over the course of individual lifetimes, we can observe how movement shapes structure. The coach potato person develops a different structure that the active person. The tai chi person develops a different structure than the weight lifter. The weight lifter develops a different structure than the swimmer. The swimmer develops a different structure that the ballet dancer. While the basic blueprint of human structure is quite similar from individual to individual, the MOVEMENT of the individual develops his or her structure in a unique way. In tai chi, we term this absorption and transmission of energy “storing and sending” or “borrowing and returning”. We need the help of the “bubbling well” to do it with maximum efficiency. If we look at the Figures 2,3,4 photo sequence of the woman jumping, we see the same use of structure that we saw in the photos of the dog jumping: the woman pushes against the ground and stiffens her body enough to transmit the ground force upward to lift her body off the ground, then she lets her body fold up to absorb the force, allowing her to land without bouncing back up into the air. Placing our weight into the “bubbling well” means placing our weight in an area defined by the 3 arches of our feet which are unified by the plantar fascia, Figure 7. 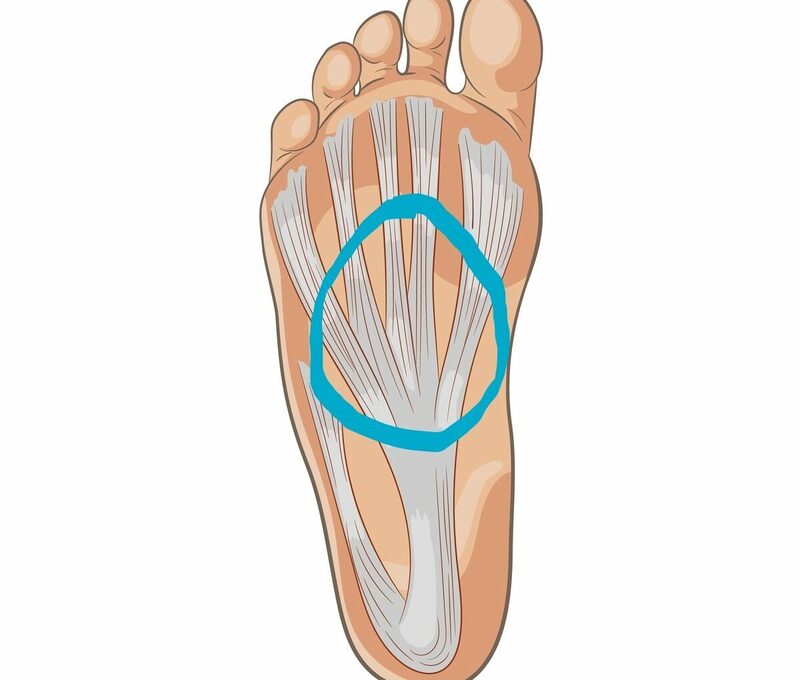 This creates an evenly distributed stretch of the plantar fascia which elongates all three arches of our feet and extends the toes forward sort of like a cat extends its claws when it stretches its legs. It is important to understand that the “bubbling well” is a structural reality of our feet. Putting our weight into this area gives us maximum EMA for absorbing and transmitting gravity and ground force. The “bubbling well” is not a metaphysical concept, it is a physical concept based on astute understanding of the biomechanics of the human foot. 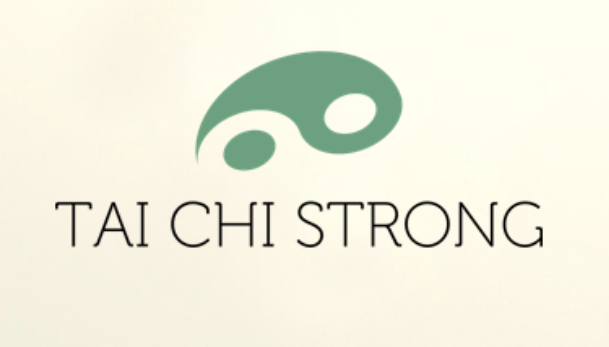 When we begin our tai chi journey, we have not had much experience with “cat walking” or developing energy storing “relaxation or extending” within our bodies. Our feet need the movement of tai chi to become conditioned to stretch and store energy, we need to develop more softness (absorption) in our footwork. Foot wear is a consideration because foot wear can prevent the natural function of our plantar fascia. Foot wear that has a raised heel or is too narrow or short in the toes will prevent the internal structure of our feet from moving when we place our weight into the “bubbling well”. Foot wear that has a heavily cushioned sole will also impede the conditioning of the plantar fascia and our feet in general. Cushioning within the sole of our shoes will absorb energy but not return it very effectively. This kind of foot wear will interfere with the natural balance of store and release within the structure of our feet. Foot wear that simply protects the surface of our feet from cuts or bruises and allows room for our foot to expand in weight bearing phase is the best footwear for tai chi practice. How do you know your weight is into the “bubbling well”? Notes from Grandmaster Yang Jun’s lecture, TTM seminar, September 1, 2018, Danbury, CT.
1. Paoletti, Serge. The Fasciae, Eastland Press, Seattle, 2006, pgs. 13-14. 4. Dial, Shubin, Brainerd, Eds. Great Transformations in Vertebrate Evolution, pgs. 228-229. 6. Guimberteau, Jean- Claude and Armstrong, Colin. Architecture of Human Living Fascia, Handspring Publishing, Edinburgh, 2015, pgs. ix-x.